DHEA: IF YOU AREN’T SUPPLEMENTING, YOU’RE SUFFERING – DHEA (dehydroepiandrosterone) is a naturally occurring “anti-aging” hormone in your body that starts to decline around age 28. Low DHEA levels in adults have been linked to depression, fatigue, anxiety, low libido, sagging skin/wrinkles, and weight gain. Because DHEA is not found in any food sources, the only solution is a pure, high-quality, clinically-dosed supplement: Enter Sheer DHEA. MOST PEOPLE SEE BEST RESULTS WITH 100mg of DHEA – Most DHEA supplements are under-dosed, making them useless to your body. Unlike them, Sheer DHEA packs a whopping 100mg in each serving to help you enjoy real results that you can see and feel. GUARANTEED RESULTS OR YOUR MONEY BACK – Sheer Strength Labs guarantees that you enjoy lasting results that you can see and feel or you can return even your opened bottle for a refund within 60 Days. Hit the ‘Add-to-Cart’ button at the top of the page now to try Sheer DHEA 100% risk-free! 100% PURE – Sheer DHEA is 100% Free of the GMOs, preservatives, binders, fillers, dairy, gluten, soy, peanut, egg, or hidden ingredients found in many DHEA supplements. 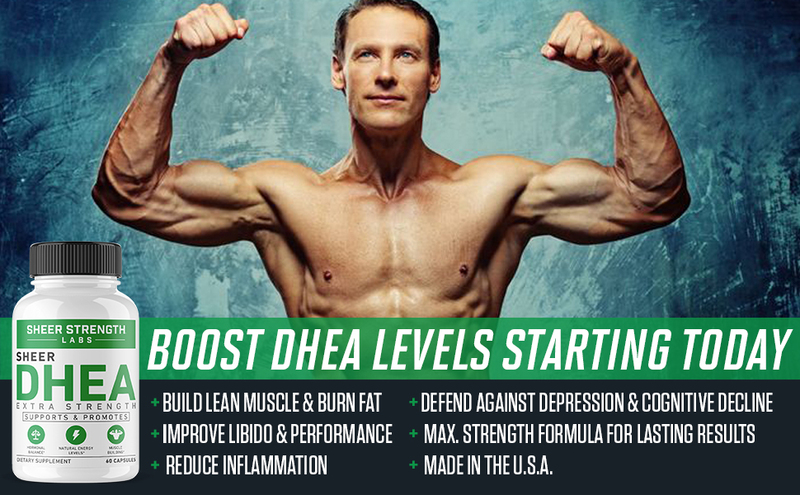 PREMIUM QUALITY and PURITY YOU DESERVE – Sheer DHEA 100mg is manufactured in a state-of-the-art GMP-certified facility in the USA from the absolute purest globally-sourced DHEA. This is done to guarantee the highest levels of ingredient purity, potency, and safety that you need to enjoy real results. Ready to get started? Hit the ‘Add to Cart’ button at the top of the page now! HEA (dehydroepiandrosterone) is often called the “youth hormone” by scientists because it’s responsible for so many of our body’s functions that keep us looking and feeling young, healthy, and in shape. Remember: If you aren’t supplementing with DHEA right now, you’re missing out.